Hurray for the Success of the 2018 VG4A Cycle Tours! 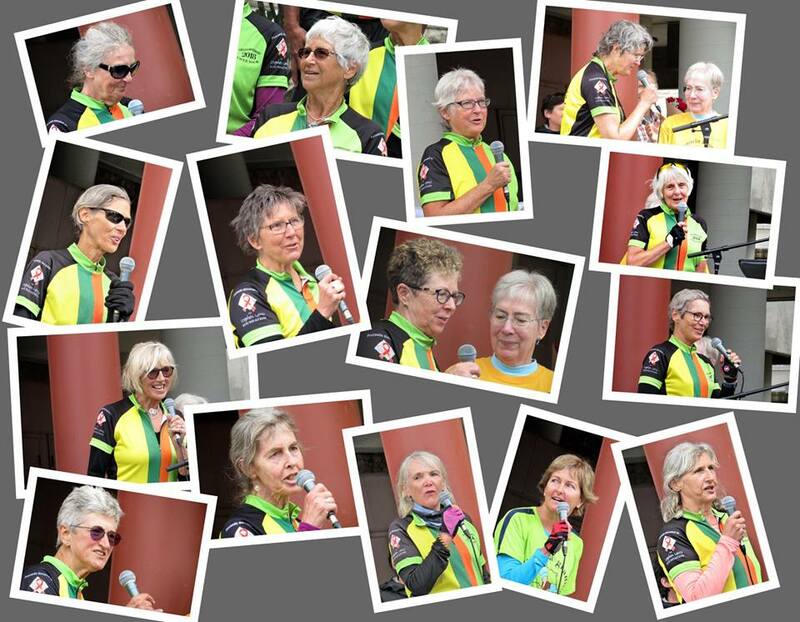 The Welcome Home Celebration in Centennial Square on September 9th saw a crowd of supporters and well-wishers cheer the arrival of 23 cyclists from the 275 km tour, and 6 cyclists from the 50 km tour, all led in by Mayor Lisa Helps. Together the tours raised a remarkable $80,000.00. What an amazing effort. Well done riders! Both Cycle Tours are fundraisers for the Stephen Lewis Foundation’s Grandmothers to Grandmothers campaign. Cycling is an especially symbolic fundraiser because it is a common mode of transportation in Africa. In addition to VG4A, seven Island grandmother groups along the 275 km route of the longer ride help and support the tour by providing meals, snacks and enthusiastic cheers. They include Campbell River, Merville, Glacier (Courtenay Comox), GLAD (Denman Island), Oceanside (Parksville), Nan Go (Nanaimo) and St. Andrew’s (Sidney). Their support, in turn, energizes the cyclists to keep on pedaling and ultimately achieve their goals. The Sunday lunch for the 50 km and 275 km riders together also involves the Sidney grandmother group. On Sunday September 9, I arrived at the Mill Bay ferry enroute to Victoria with the Victoria Grandmothers for Africa 275km fundraising cycle tour. I was drenched with rain but in high spirits from the dedication and encouragement of the support groups along the way as well as companionship and inspiration of our fellow riders. However, my high spirits were dashed when I arrived home to discover my wallet (containing cash and driver’s license) was missing. I had tucked it into the back pocket of my shirt before entering the Cowichan Café and thought I had returned it to my panier before boarding the ferry. When I arrived home much later that evening, I found a large brown envelope stuffed into my front door. On it was this note: “Hello, my name is Hardeep and I am the deck hand on the Brentwood Bay ferry. I found this in front of my truck on the road. I remember your face because you said thank you.” I called Hardeep and learned that he had driven all the way from Brentwood Bay to my home on Lands End Road in North Saanich, delivered the wallet, and then driven back to his home in Nanaimo. This is truly an act of human kindness. Thank you Hardeep. Riders are welcome to join in informal Monday morning winter rides. Riders meet at Matticks farm (the time varies according to the weather). Contact Helen Pedneault helen.pedneault@shaw.ca if you wish to be added to the email that Helen sends out on a Sunday evening. In addition riders interested in the 50 km distance are currently meeting at Caffe Fantastico on Harbour Road on Fridays at 12:30 pm. The contact person for this ride is Lynn Kobierski. lkobierski@gmail.com Lynn sends out a note on Thursday to confirm the Friday ride. Please get in touch with her if you are interested to have your name added to her list. Monday - August 6.. 14 riders turned out for the first of our back to back rides..90 km covered:) Fantastic effort! Above .... Switch Bridge on May 7th.... another glorious spring day.... was the meeting place for the beginning of the 275 km training ride - in the photo to the right Heather (ride leader for the day) reviews the day's route. From left to right - Fonda, Patti, Gail, Judy, Patti and Daphne.